Another one of my great teachers has died. 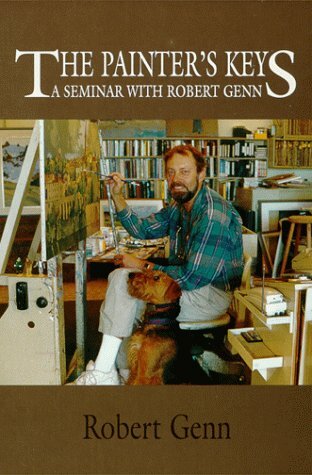 Canadian painter Robert Genn died May 27, 2014, creating a huge void for the thousands of artists around the world who cherished the wisdom and encouragement he shared so generously for years. His daughter Sara, also a painter, will continue the free twice-weekly letters to artists, sent by email to subscribers and published online at PaintersKeys.com. Generosity seems to run in the Genn family as much as artistic talent and discipline. I've reread his book, The Painter's Keys, many times -- and it's well underlined. (Note that if you order a copy from the image at left, you're contributing a small amount to my income.) The book is chock full of great advice. The one thing I remember most from this book -- aside from its overall tone of encouragement -- is that there was a point early on when Robert Genn shut himself off from the rest of the world for six months. He just painted, that's all. Nothing else. It was that time of discipline and focus that laid the foundation for his many years of success later on. "Success" is an interesting word. In origin it's related to "succession." In other words, it means "coming into one's place in the world." Sometimes one's place is bestowed from the rest of the world, as when a king or queen "succeeds" to a throne. For someone like Robert Genn -- and for most of us -- it's more often a creative process. It takes focus, discipline, and an encouraging, "pro-creative" environment. Robert Genn contributed to such an environment, for thousands of artists all over the world. He created a vibrant, lively international community online. Of course there's a sense in which he lives on in our hearts. His advice and wisdom is timeless and stays available online. I hope that his generosity will bloom in my heart too. None of this eases now, however, the pang of loss I feel. I feel a bit more orphaned, a little less steady. I have to grow up a little more. If you're a visual artist -- or would like to be one -- it's not by any means too late to access this lovely man's encouragement and sound advice. Don't pass it up!